Well, I guess I would be more motivated to blog if it were easier to load photos. So now it's been a whole year since I posted anything here, but I actually have been creating lots of projects! Make it easier for me, Google! It takes so darn long to load photos...grrr! 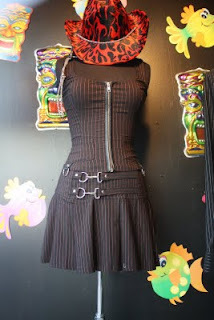 At left here is a photo I took in a store window of an outfit both my teenage daughter and I fell in love with. It has sort of a Burdastyle flavor. And somehow I have tons of pinstripe fabrics. Just not any red metallic ones, like this here. My daughter loves lots of hardware on clothes. The other day she saw a hoodie sweatshirt, normal style except for 4 metal belt buckles fastened to the front, over the center zip. I thought, "How impractical!" and then realized the buckles actually had snaps behind them. Ha, more hardware! She was so drooling over that jacket... I think I'm finally starting to understand what her clothing preferences are. Stuff that will ding my dryer until the family screams, "Stop that awful noise!"